The AFR will slowly in time have more structures on the railway & will be added here. Above are pictures of a NZR water vats found on the Railway. This bridge is on its 2nd Railway. 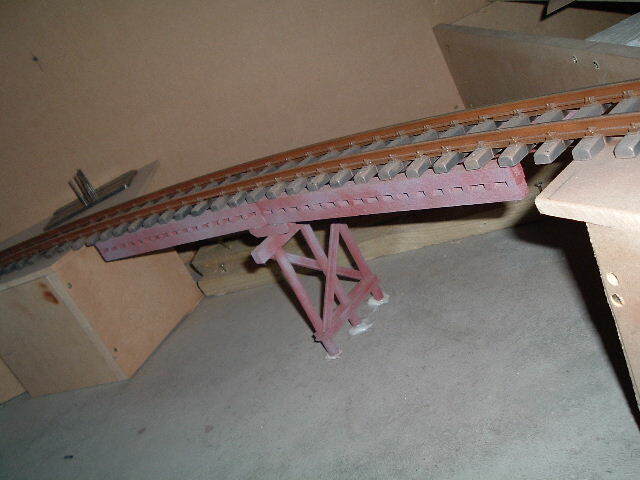 The beams are constructed out of wood & styrene with 300 dress pins for rivets in each beam it was under-coated with VHT red oxide with a top coat of clear. It has stood the test of time being outside since 2002. The piers are concrete, cast in a mould made from split pipe with a spacer to get the flat between the curved ends. The bridges guide rails were drilled & tapped with machine screws to the sleepers, all this was done on the work bench then installed out-side. The piers are mortared in place on a concrete foundation with the beams floating on top. This is the newest built bridge on the railway, No4 bridge is built out of treated pine stripped down to the required size. It is situated on the inside line from the loop to the yard, as you can see in the first photo still a bit more finishing to be done. Above Left; No1 bridge is the oldest structure on the railway, it has survived 3 railways & is still very sound, until Feb 2019!!! Above Right; No1 bridge after its rebuild/ restoration.